Purpose is the reason for which something is done or created or for which something exists. The cleaver thing is that everything and everyone is created for a purpose and with a purpose . Life is just a finding out what you’re purposed to do, and doing it intentionally . Everyone is born with some sort of purpose. Everyone is designed with something special inside of them . Usually their abilities are natural, it comes easily it flows freely. When someone finds their purpose in life , it makes them happy , they no longer search for an answers to make them happy or to fulfill a void in their life . It is so funny that you can be born without a clue what place you need to fill in the world but you will always have a feeling that you need to do , to create , to fulfill. Our parents begin our journey to find purpose by pointing out the good things that we can do . Parents are good at this because they can see strengths and weaknesses when you yourself don’t see the good in you . When I was a little girl there were two things that I loved to do most, I loved to dance and at an early age I had the ability to write or compose a good story even when I couldn’t spell very well. But there were times that I would sing really loudly , or try to run and do things that I saw other kids my age do . One day while riding down the street and while I was singing annoyingly in the back of the car , my dad finally said , Tesha singing is not going to be your thing. I was humiliated and mortified. I think I cried. And I asked him what am I supposed to do . My mother said you’re going to be a dancer and you’ll dance around the world. I embraced it . I danced to everything all day everyday . And for a while my daily outfit was some sort of dance leotard and a skirt. I studied my craft too , watching Janet Jackson, Paula Abdul and Debbie Allen all day . Practicing their moves as much as I could . I did ballet and jazz too . Teaching myself most of the moves. It was in High school that I began to dance around the world. Purpose found me through my parents. Dance opened some doors for me that I didn’t think could be possible. I found purpose unintentionally . Sometimes we find purpose by watching others. Finding purpose this way can be tricky. You can see someone doing something that makes them happy and fulfilled and you think that you can do that same thing and find fulfillment. My mother is a hair stylist by profession and growing up I had to work in the salon . I washed and prepped hair, braided hair , and other things. While through high school and college and even now her business is wonderful . It brings her so much joy and it paid for some of my college needs, purchased most of my cars and all of my clothes . While I was in college I did hair on the side to make money . After all I had all the training that I needed from working years with my mom. I charged between $5-30 to do hair. I trimmed ends, did colors, cut hair, added hair , arched eyebrows, flat ironed and more . This money supported my shopping addiction . When I got out of school on Thursdays I had girls lined up at either my dorm room or my apartment to get their hair done for the week end . And though I enjoyed the money , when I pulled up and saw the girls waiting for me I hated it . It was more a task than a fulfillment , I didn’t like talking all the time some days I just didn’t wanna be bothered . I knew very early that this wasn’t a passion or a purpose for me . And though I saw it bring fulfillment to my mother it didn’t do the same for me . And just because I will inherit two salons ( LOL) I will not work in them . So watching others doesn’t necessarily find your purpose. Sometimes purpose comes from a deeper place. And though you can pick up habits and other things from people you more than likely won’t find your purpose this way. Isn’t there a word for this…vicarious …maybe. Sometimes purpose finds you . Again this is rare but it happens . There are things that happen to you in life that leads you to your purpose. I have seen this a lot with people who have had situations in life that they had to process. And the process of life has given them a purpose for life. Although the , “me too, ” movement has a few flaws in it , it obviously came from a place of hurt and disgust . These women were actresses , producers, writers or directors and they thought that perhaps that would be their only purpose but something happened to them and it affected them so much that purpose found them , unfortunately. Omarosa found a new purpose in life after she was hired by the Trump administration. I don’t believe she walked into that job thinking that she would be fired early and then there was a book deal with recorded messages. Sometimes your purpose can be scary or uncomfortable . You can find your purpose when you see a need. There was a person who invented the wheel , the telephone, the cellphone and then text messages with emoji’s . There is someone who invented the internet to allow people like me to set up web pages to write all sorts a of junk that makes them happy and fulfilled. These individuals saw a need and found their purpose and fulfilled a need all at the same time . Having a purpose is amazing in finding motivation. Motivation to go on everyday and better yourself. 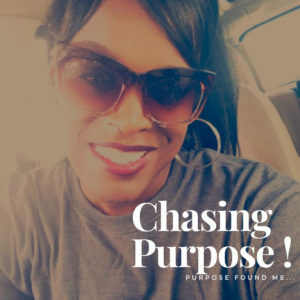 I am 40 years old and am still chasing my purpose. Someday, I will figure out what it means to me. Until then, I will just have fun flying by the seat of my pants. I am all for living a purposeful life. My dream is to help myself and everyone find their purpose in life. Also, I love that you work in entertainment! Before being a full-time stay-at-home mom I was a casting producer in reality tv! wow that’s awesome … do you ever want to go back ? I have been trying to find mine. Sometimes I think it’s to have kids, raise them right, and basically carry on the human race. But I don’t know what my specific purpose is in the scheme of it all. Knowing your purpose is so important. I believe it gives you the drive, the motivation, the reason to get up and do great things daily. Well put! I think the hardest one is the purpose is the one that finds you. For me, most of the time, those are things that are thrust upon me by difficult life circumstances. I have to find acceptance for my situation before I’m able to find the purpose hidden within. We all have a purpose and having goals helps us stay on track. This is such a great motivational blog. Love that you’ve found your purpose. Thanks for sharing your genuine thoughts. This post reminds me of the types topics people would write about when blogging first became a thing. This post of yours is so enlightening! I think I have found my purpose in many activities throughout my life, but there is more to come. Because I’m convinced, after all, we have a common purpose as humanity, that is to ensure human future generations live better than in the past. But that’s not so easy as it sounds and as individuals sometimes our efforts for common well-being end up creating something worse in the long term (like petrol and oil were a great development back in the day, but now we see they are terrible sources of pollution). When we seek our purpose, we need to be looking at the large picture too. That’s the most difficult part! This was such a great read! I loved hearing all of the ways that one can find their purpose. It’s a strange thing for sure, finding your purpose, and sometimes that can change throughout your life! But finding that fulfillment is certainly worth it! We all need a purpose in our life to chase that. Having a purpose, a goal gives us the strength and motivation to work to achieve that goal. Without a purpose, we are just waking up, breathing and going back to sleep. Very well written. I think having a purpose in life is important. This was a motivating post indeed. This is a great topic to explore. I totally agree about seeing a need and making it happen. As an entrepreneur, I’ve had the best experiences figuring out how to solve a problem or improve something. Wow! It is deep what you are saying. I haven’t put much thought into it expect I would like to live a peaceful and passionate life.